Job ter Haar | Welcome to my website! Eloisa d’Herbil was the first woman composer of Tango. She lived in Cuba for most of her childhood, and moved to Buenos Aires in 1868 (in the company of the American pianist Louis Moreau Gottschalk, who died one year later in Brazil), where she married the Uruguayan director of an auction house. She died in 1943, 101 years old. Details about her life before she went to Argentina are often conflicting. According to the website “todo tango”, her father was a French baron, Joseph D’Herbil, and her mother a Portuguese duchess Raquel Angel de Cadia. She was born in 1852 in Cuba. However, another article on the same website claims she was born in Spain, studied with Liszt, and her father was the owner of large estates in Cuba. According to Wikipedia, she was born in 1842. Many articles mention her aristocratic origin: she is often referred to as “the baroness”. What does this have to do with the subject of my research, the London-based Italian cellist Alfredo Piatti? It started with a small article in a newspaper from 1857 that we found during our search in the British Newspaper Archive. An Italian named Giuseppe Angelo Diherbil went bankrupt and was put in prison because he was unable his debt of £150 to another Italian, an artist named Piatti. He had obtained 12 paintings of Piatti and had tried to sell them, but, as he claimed, the paintings were of little value. This in itself was already a surprise to me. I knew that Piatti, who had a glorious career in England at that time, was sometimes selling musical instruments and also offered his service as an expert in setting up stringed instruments. I didn’t know his extra-musical activities included selling paintings to dubious fellow countrymen… but we can’t blame him for suing Diherbil. £ 150 at that time was half the yearly income of a middle class family. The story became more and more interesting. I tried to find some information about this Giuseppe Diherbil, but I found no trace of him. Then I tried different spellings, and “d’Herbil” gave me some leads. First of all, “Perry’s Bankrupt Gazette” (that’s a nice name for a newspaper!) of 7 November 1857 mentions a certain Giuseppe d’Angelo d’Herbil, Berners Street, in no business, who had been in a hearing at the courthouse. It is easy to imagine how Piatti, keen on making some extra money, had come into contact with a fellow musician, and had started doing business with her husband. 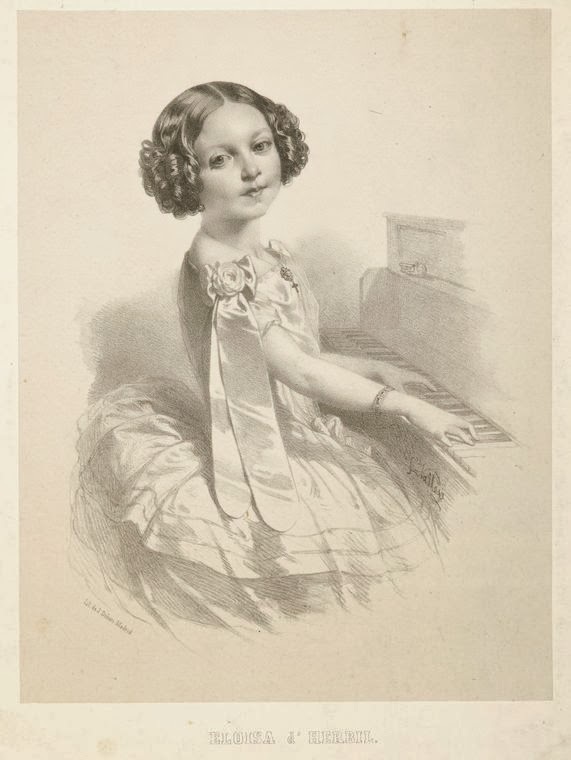 At the same time, a child prodigy named Eloise d’Herbil was having some success as a pianist in the salons of London. Her concerts were generally well received in the press. In a review from 1855 it is stated that she was 7 years old at that time; later reviews that mention her age are consistent with that. The last time she appears in a newspaper in England is on the 26th of May 1858. After that date, she seems to have vanished completely. Still intrigued by the story, I started searching Google for the name “d’Herbil”, and then I found out that she had moved to Argentina and had become a tango composer. At first I found it hard to believe that she was actually the same woman as the Eloise d’Herbil that I had found, but there were just too many similarities. The tanguera apparently started off as a child prodigy, she appeared at concerts in England, and her father was named Joseph. Her date of birth didn’t seem to be right, because if she would have born in 1842 she would have been 13 years old in 1855, not 6. However, in other biographies her date of birth was stated as 1852 or 1846, so there was a lot of confusion about that anyway. My theory for the moment is that Eloise has made up the whole story about her family later in her life. Possibly her father was an imposter, which would explain the changes in his name, but her noble descent is mentioned in none of the newspaper articles I found, so it is probably not a story that he had invented. 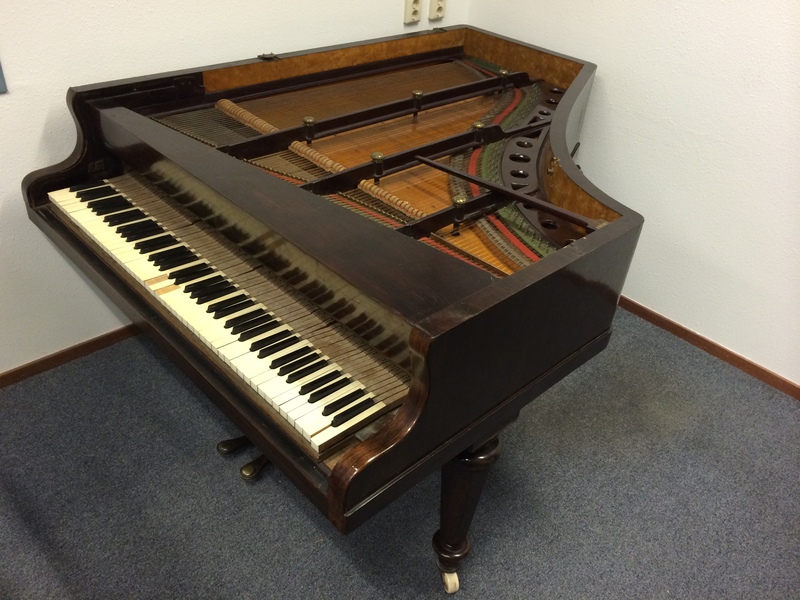 This grand piano from 1870 by Collard & Collard will hopefully be restored in the coming months. I will use it for house concerts with repertoire connected to my research and maybe even for recordings. How it came into my possession is an interesting story. I promise I will post it here one day. For now, let’s just say that it is in remarkably good condition for a piano that has been standing on its side for over 15 years. In a sauna. Here’s a new post, after almost three years of silence! The coming years I will use this blog to share some of the results of my research project. Maybe it will become a kind of irregular research diary. Let’s see how it develops. Hi everybody, this is going to be my new website. Blog style. The coming weeks I will work on the design and content. For now, I’m just experimenting! You can navigate this site with the menus on the picture (colored canyon in Sinai) .